David was born to John and Rebecca (Hawkins) Crockett on August 17, 1786 in Greene County, Tennessee. The family followed the patterns of western settlement, moving three times by the time David was 12. In 1796, the family opened the Crockett Tavern on the road from Knoxville, Tennessee to Abingdon, Virginia in present-day Morristown, Tennessee. The building today continues to stand is on the National Register of Historic Places. Two years later, in 1798, John Crockett hired his son out to Jacob Siler to help drive a herd of cattle to Rockbridge County, Virginia. When the job was complete, Siler tried to detain David by force, but the 12-year-old escaped at night by walking seven miles in two hours through knee-deep snow. He eventually made his way home in late 1798 or early 1799. Soon afterward he started school, but preferred playing hooky and ran away to escape his father’s punishment. He did not return home for some 30 months. While he was away he worked as a a wagoner and day-laborer and at odd jobs to support himself. When he returned home in 1802 he had grown so much that his family did not recognize him at first. When they did, he found that all was forgiven. Crockett reciprocated their generosity by working for about a year to discharge his father’s debts, which totaled $76, and subsequently returned to school for six months. On August 14, 1806, Crockett married Mary “Polly” Finley, and the couple would eventually have three children. They remained in the mountains of East Tennessee for just over five years. In the fall of 1811, he moved his family to Lincoln County, Tennessee and in 1813 moved them again to Franklin County, Tennessee. 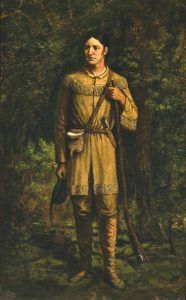 Crockett supported his family primarily as a farmer and hunter. 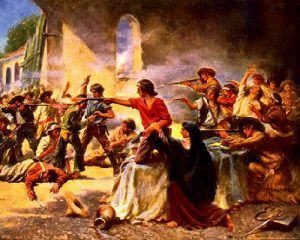 In 1813, following a massacre by Creek warriors of the occupants of Fort Mims, Alabama, Crockett enlisted in the Tennessee Militia. He participated in the Battle of Tallussahatchee of the Creek War in northern Alabama, but returned home when his enlistment was up; missing the decisive Battle of Horseshoe Bend on March 27, 1814 when the Creeks were defeated. During his second enlistment, which began in September, 1814, he joined Andrew Jackson’s forces at Pensacola, Florida during the War of 1812, but was discharged again prior to the ; Battle of New Orleans. In 1815, Polly Crockett died in 1815 and a year later, David married Elizabeth Patton. In the fall of 1816, Crockett moved his family to what would become Lawrence County, Tennessee. He served as justice of the peace and commissioner for the town of Lawrenceburg and rose to the rank of lieutenant colonel-commandant in the local militia. In 1821, Crockett was elected to the Tennessee legislature, where he served two terms. In 1827 Crockett was elected to the United States Congress from Tennessee, where he served from 1827 to 1831 and again from 1833 to 1835. Crockett’s tenure in Congress was most noted by his opposition to the president, fellow Tennessean Andrew Jackson, on land reform issues and the Indian removal bill. It was during this time that the legend of Davy Crockett began to grow. Crockett promoted himself as a simple but honest man who was an outstanding hunter and marksman. 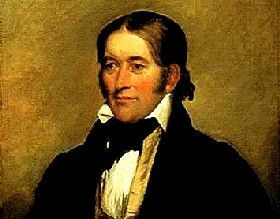 In 1834, he published an autobiography, A Narrative of the Life of David Crockett of the State of Tennessee, which made him a popular figure nationally. Afterwards a number of books and almanacs began to appear, claiming to be true stories about David Crockett. Narrated in frontier lingo, these tales often related bigger-than-life adventures, making Davy Crockett a frontier hero in his own time and for generations to come. The very next month, he arrived at the Alamo with his group of Tennessee Mounted Volunteers. Fighting against Santa Anna during the siege of the Alamo, he lost his life on March 6, 1836, along with 189 defenders. After his death, he continued to be credited with acts of mythical proportion. These led in the 20th century to television and movie portrayals, and he became one of the best-known American folk heroes. Compiled and edited by Kathy Weiser-Alexander, October, 2017.